Health Guru is a New York City Internet company that provides online health information videos. Founded in 2006, Health Guru has a library of more than 3,500 videos and more than one billion cumulative streams on Healthguru.com. Health Guru also developed a video syndication technology so that its partners can access the video library for their own websites and use Health Guru products and services to manage content. Health Guru was using a local memcached solution integrated into its web servers for local caching. To manage scalability and performance demands for its website and video syndication service, the company deployed additional web servers to increase caching space. This was a short-term solution and Health Guru continued to explore different caching options. The company uses Amazon ElastiCache with a standard memcached method (caching partial site components and pages) to support traffic volume to Healthguru.com. It uses Amazon ElastiCache in a unique way for its video syndication service. “Our primary syndication differentiator is our ability to customize client-side widgets and deliver them to partners independent of sophisticated identity information and using only the passed URL,” describes Alquaddoomi. To enable this solution, Health Guru uses Amazon ElastiCache to store complete client scripts to deliver to individual URLs. 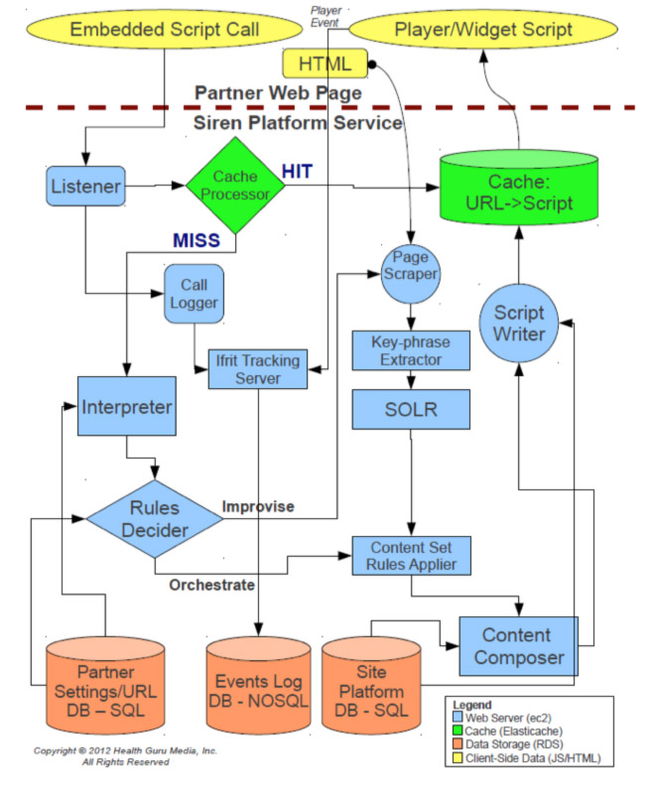 The figure below provides a diagram of the video syndication architecture. Alquaddoomi recommends that developers treat Amazon ElastiCache as an easier-to-deploy version of the locally memcached service they are already using. “Once we realized there was nothing more complicated we needed to do, Amazon ElastiCache became very easy to integrate with all our applications,” he says.